"SAHIB, BIBI, NAWAB BALUCHAR SILKS OF BENGAL 1750 - 1900 December.11,2014 to February.15, 2015"
"Strands of Joy: Folk Embroideries of India, Surat (India) December 14th, 2011 till May 9th, 2012"
The Exhibition displayed embroidered folk textiles from the length and breadth of India : Phulkari wedding veils from Punjab, the Kantha of Bengal, Kasuti of Karnataka, Banjara embroideries of Maharashtra and Andhra. Chamba Rumals of Himachal Pradesh, appliqué-patchworks of Orissa, Shawls from Nagaland and Rajasthan, shrine-cloths from U.P and a strikingly spectacular range from Saurasthra and Kutch. In their leisure time, wives and daughters of peasants and farmers, shepherds and nomads, merchant and other hereditary occupations have engaged in creating an enormous array of patterns in embroidered textiles. This makes the Indian subcontinent a rich treasure-house of artistic, home-based needlecraft. This glorious legacy was laid out for viewing during this Exhibition. 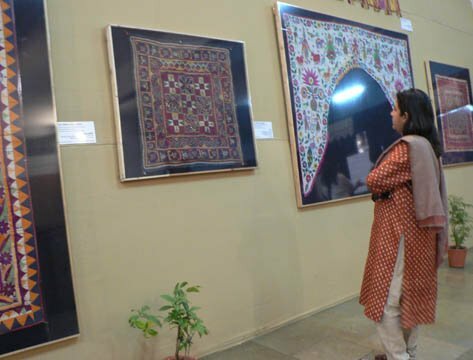 "The Textile Heritage of Gujarat" was open at the Garden Gallery of Textiles, Surat, ( India ) from 5th February 2010 till 30th April 2010. Gujarat's textiles,right from ordinary cotton baftas to the most luxurious brocades, all find a place in the rich cultural, social and commercial inheritance of the people of Gujarat.Great diversity, artistry, skill, technological and entrepreneurial pluck has given Gujarat its magnificent kinkhabs, patolas, mashrus, tanchhois, ikats, painted textiles, block prints, tie-dye bandhej, its exquisite urban and folk embroideries and patch worked and beaded textiles. From a lost past to a living present, the Exhibition presented selections from the Collection and textiles on display covered a span of 700-800 years lending a rare glimpse into the textile tradition of yester years. 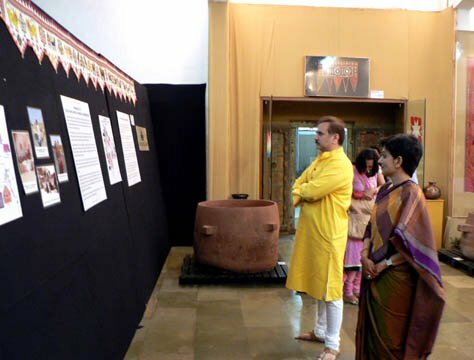 Was also kept open for public viewing in Mumbai at Chhatrapati Shivaji Naharaj Vastu Sangrahalya (formerly The Prince of Wales Meseum),from 08 February to 02 March 2008. 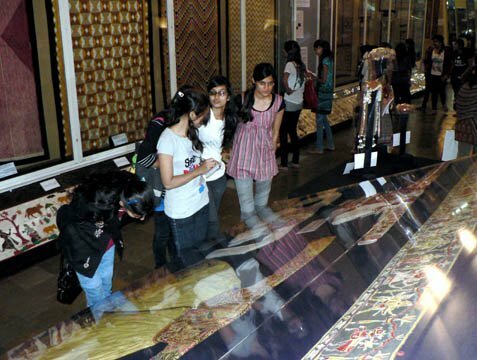 Held at the National Museum, New Delhi November 11 to January 15, 2006. 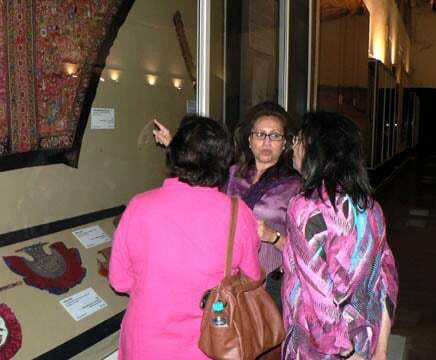 The exhibition was a collaborative effort of the TAPI Collection, Mumbai, and Indias premier official museum, the National Museum, New Delhi, India. "Remembering Bhupen": A Bhupen Khakhar Comemorative Show from the Bhupen Khakhar Estate and the Tapi Collection at the Garden Gallery of Art, Mumbai in March 2005. 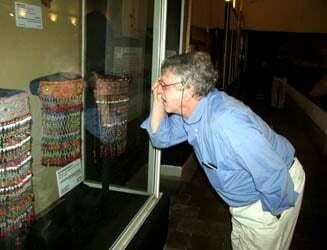 "Glimpses of the Past: Masterpieces from the Tapi Collection" at the Garden Gallery of Art, Mumbai in March 2003. 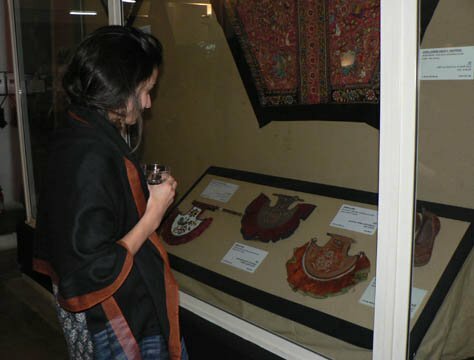 "Indian Trade Cloth from the Tapi Collection" at the British Council Auditorium in January 2003.